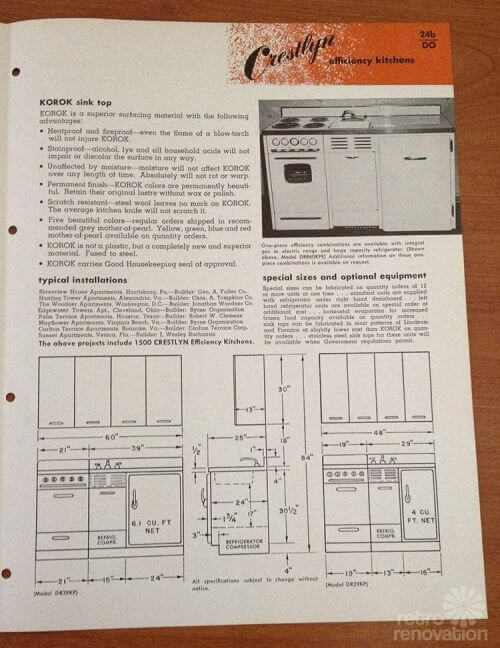 If you have been looking for that special piece to finish your retro kitchen remodel, look no further! 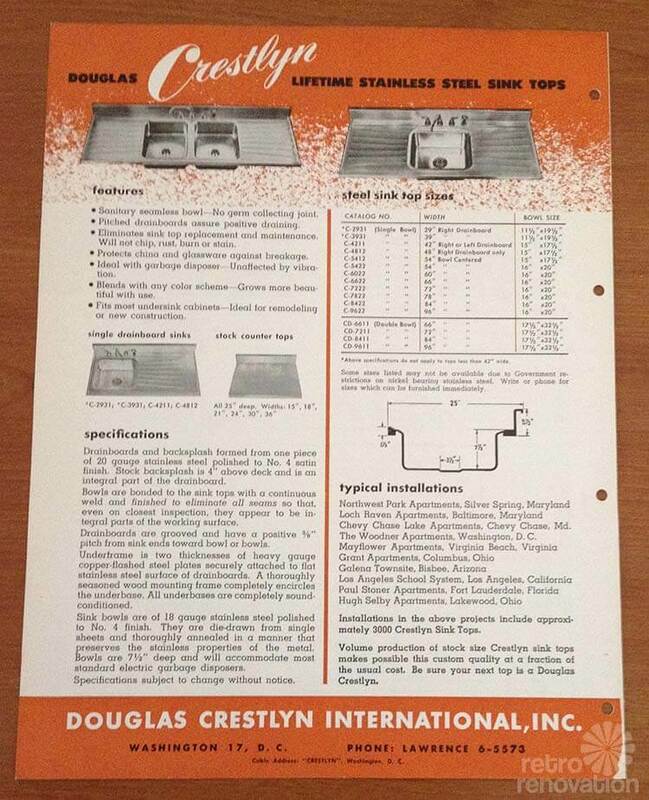 Selling vintage Douglas Crestlyn 1950’s / 60’s stainless steel countertop, sink with double drain boards. 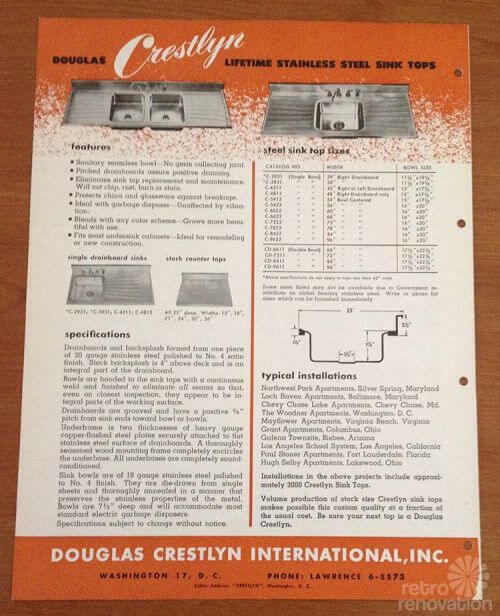 This is a very rare and unique piece as it was the largest countertop/sink combo made by Douglas Crestlyn and marketed with a lifetime replacement guarantee. 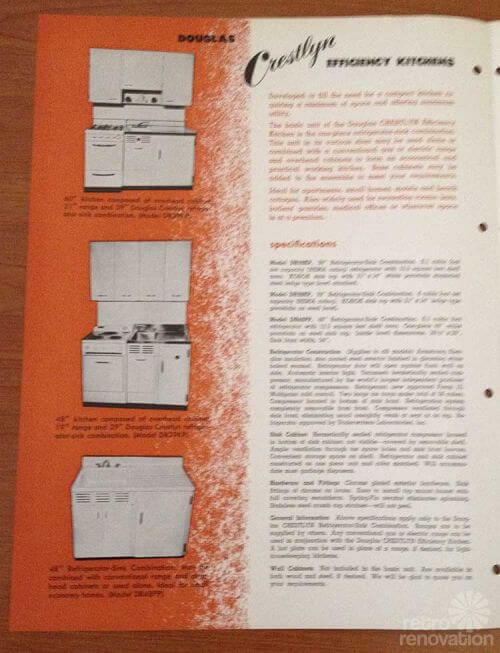 It is in good condition for its age as it only has two small dings on the right side near the backsplash. The underneath metal supports are a little rusted but does not diminish the overall quality. Dimensions are: 8′ long, 2’deep with 4″ backsplash. 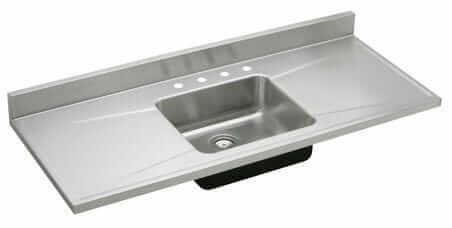 Sink bowl is 16″ x 20″, 7.5″ deep. Made of 20 gauge stainless steel polished to #4 satin finish. Double drain boards are grooved and have a positive 3/8″ pitch from countertop ends toward bowls. 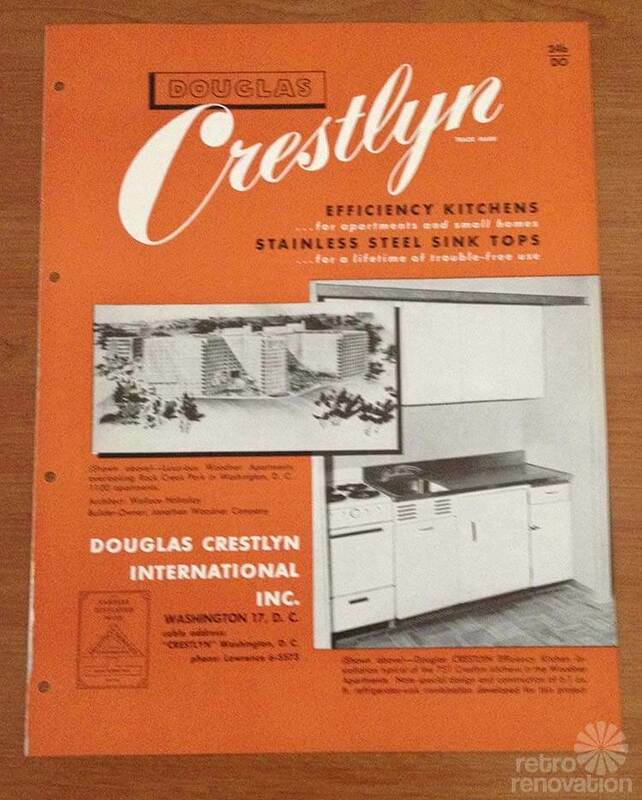 Along with the sink, I have the original “Douglas Crestlyn Efficiency Kitchens and Stainless Steel Sink Top” catalog. The original company catalog is included in the price and would top off your retro kitchen renovation and be a centerpiece conversation item to proudly frame in your kitchen. It appears that the Douglas Crestlyn Company specialized in efficiency kitchens — aka pullman kitchens, with the name coming from Pullman train cars named after George Pullman. Pam found this 1982 story in the New York Times that talks about all-in-one pullman kitchens. Here on Retro Renovation, the GE Wonder Kitchen introduced in 1955 is the most famous example of a pullman kitchen. Isn’t is SO INTERESTING to connect these historic dots! Sanitary seamless bowl — no germ collecting joint. Pitched drainboards to assure positive draining. 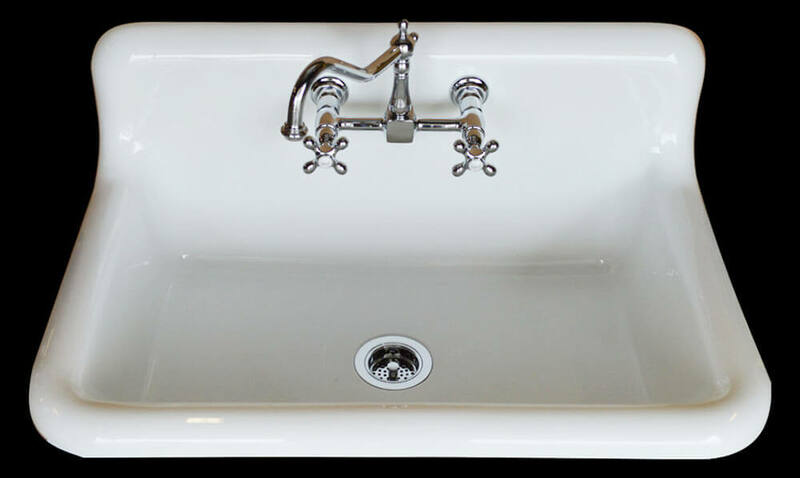 Eliminates sink top replacement and maintenance. Will not chip, rust, burn or stain. Protects china and glassware against breakage. Ideal with garbage disposer — Unaffected by vibration. Blends with any color scheme — Grows more beautiful with use. Fits most undersink cabinets — Ideal for remodeling or new construction. I was intrigued by the company as I was doing reference for value on my sink. However I was unable to find anything about the company. It appeared that they were a very large company as they had several lines of product but then seem to just quickly go out of business in the 80s. Therefore, I was just wondering if you had any additional information on the company. 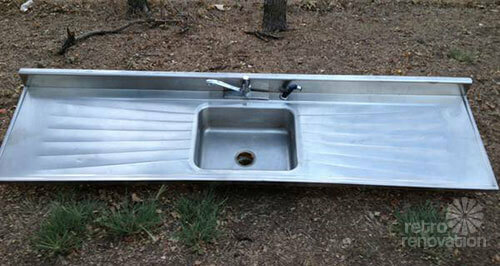 Mega thanks to Craigslist seller Shaun for allowing us to feature the photos of his fabulous sink and vintage brochure. or do you remember these from the past? I have the same 8′ sink in my kitchen. I am in the process of renovating my kitchen and am searching to see what a good asking price would be. 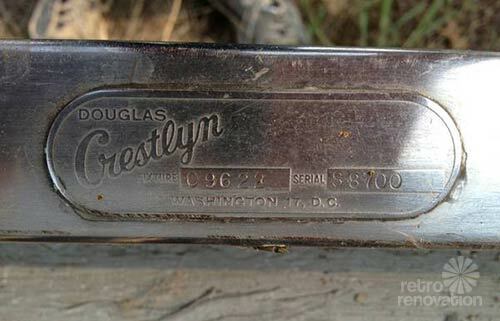 I worked for the owner, Donald Douglas in the 70’s. He made a fortune during the post war building boom in DC. He also owned an appliance distributorship in Washington. He lost it all and the business folded. I believe the units were actually mfg. by U-Line, Inc. in WI.